Yep, same. Even going back to "repeat" the gag was unnerving. 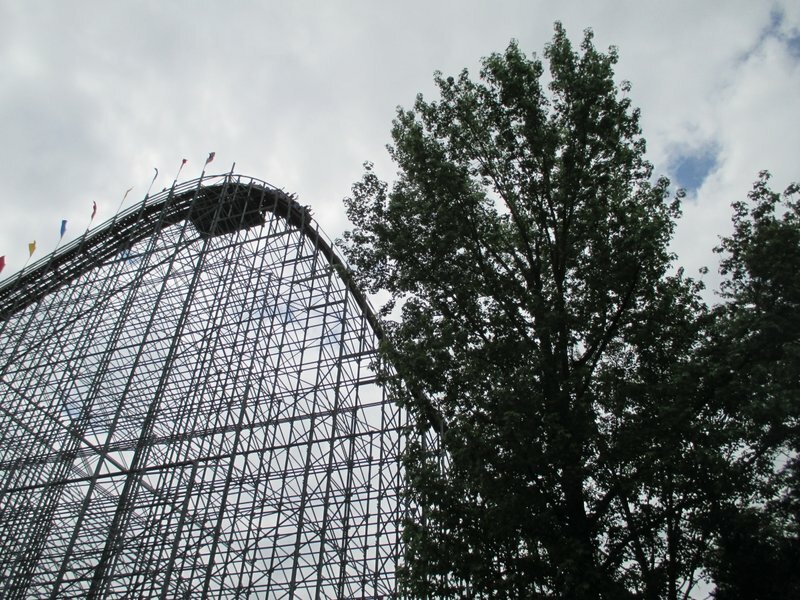 I think the number of rides that went down for maintenance added to how terrifying it is. 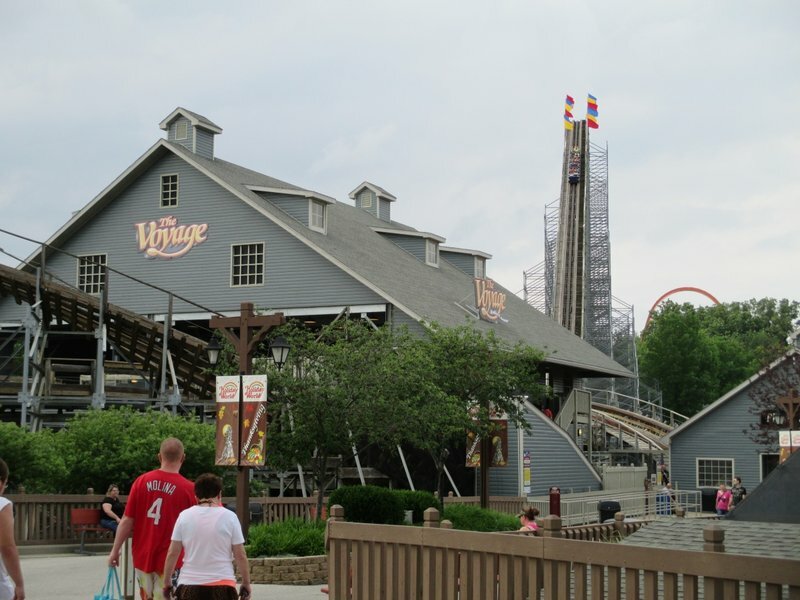 Arthur_Seaton wrote: I was in the Indiana area last week for work and was tempted to head up to Indiana Beach as, on my last visit (last August), they were having serious operations issues too and I didn't get to ride Cornball or Lost Coaster. 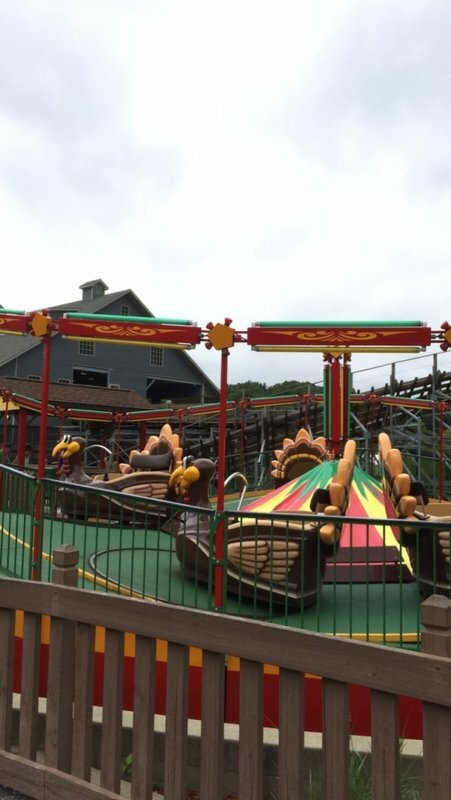 The park has a ton of character and I can see why it's so popular with enthusiasts, so, hopefully, they can get it running optimally in the near future. The haunted castle was indeed great (I assume you're talking about the drop platform? 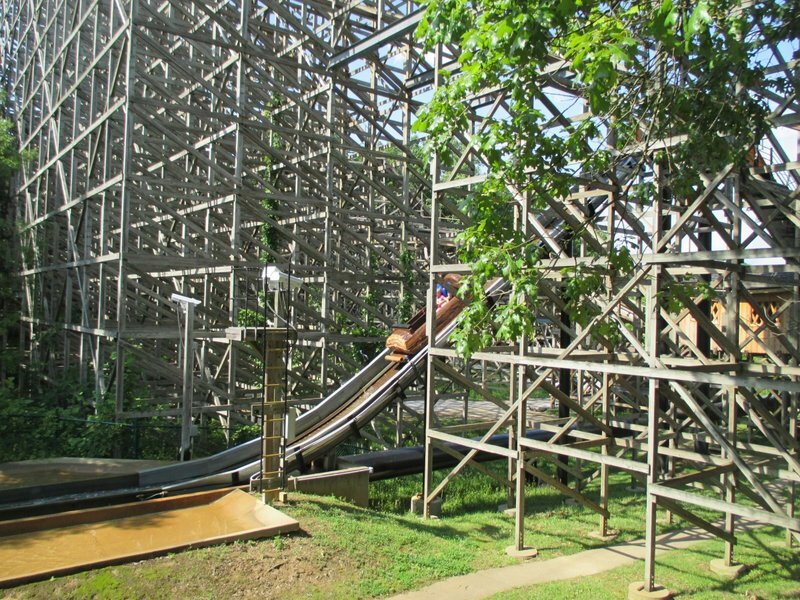 ), and I fully agree with the description of Steel Hawg's drop; it looks totally gut-wrenching but is surprisingly tame. Yes that's the gag I'm referring to. I was purposefully vague so anyone visiting in the first time won't have it spoiled. I loved that, and the "room of doors". Been through twice (two separate visits), and once that room was dimmly lit, and the other was brightly lit. Preferred the former, obviously. Also on my first visit to the Castle, an employee got really into the opening elevator scene, moving around in the darkness and popping up in random locations when the light flashed... sometimes very close to us. It was hysterical and unnerving. I do enjoy the park as a whole. I've been fortunate that when I've gone, the operations were relatively decent. It has a very retro, trapped in time vibe. But boy, it sure is in the middle of nowhere. I'm guessing that probably is a primary reason operations aren't better. edgeboy wrote: I loved that, and the "room of doors". Been through twice (two separate visits), and once that room was dimmly lit, and the other was brightly lit. Preferred the former, obviously. I knew about the drop platform already, so it didn't freak me out. I did, however, get stuck in the "room of doors" as I didn't know what to expect and was genuinely confused. It was very dark in there and I ended up having to use the flashlight on my phone to figure out what was going on. That room surprised me as well. I stood there confused for a minute or so. I think I realize how that gag works but it's cool nonetheless. 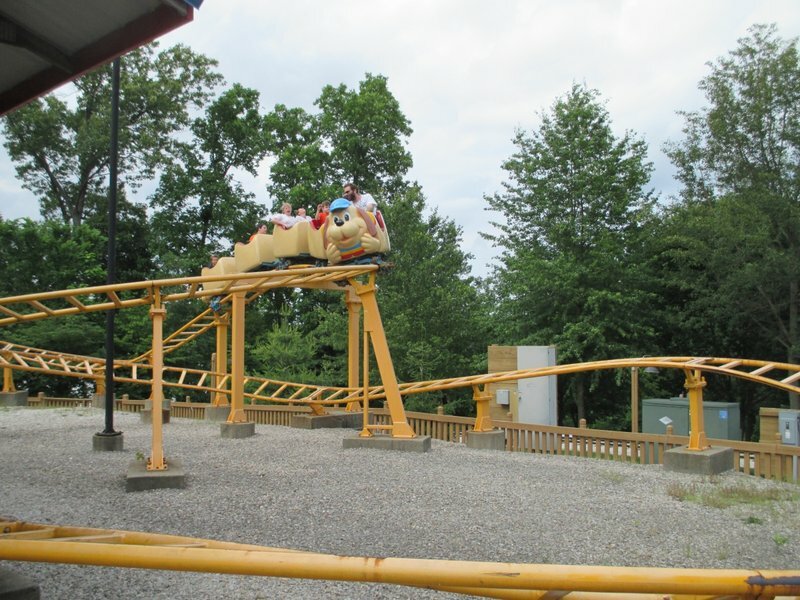 Holiday World is one of the most acclaimed parks in the enthusiast community. 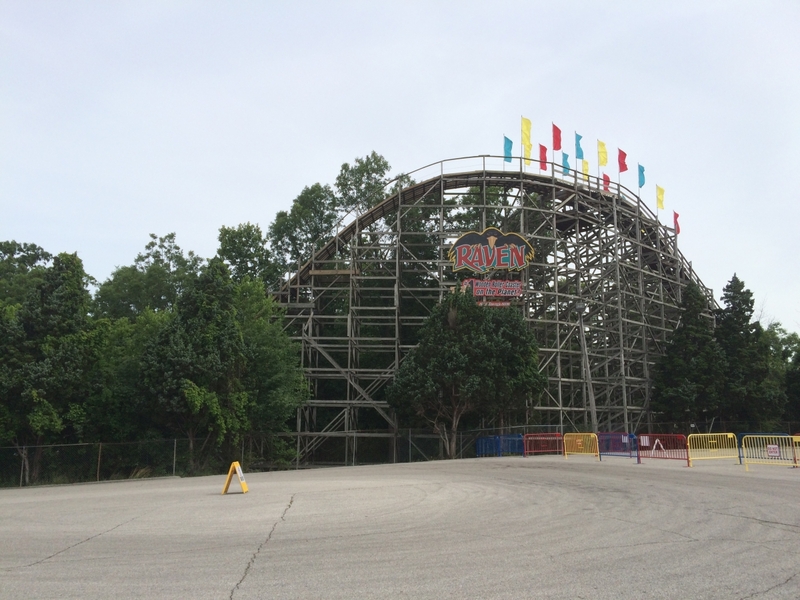 Of the parks I visited on my Memorial Day weekend trip, Holiday World was the park I was most anticipating. 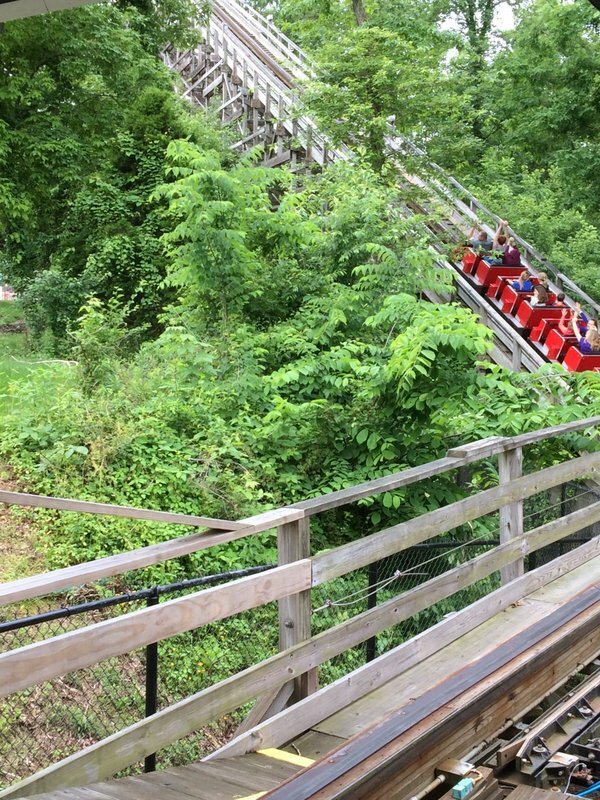 I'm a sucker for well-run family parks and wooden coasters, so Holiday World was right in my wheelhouse. 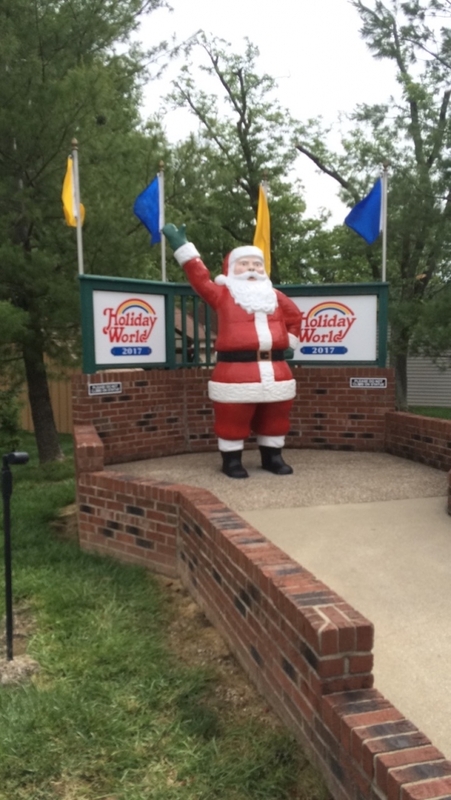 Holiday World delivered the complete package and is now one of my favorite parks. The park has a little of everything- an outstanding coaster collection, theming, good food, and does so many little things right that distinguishes it from larger corporate parks. The only negative about my visit was the 7 pm closing since it prevented me from getting night rides. 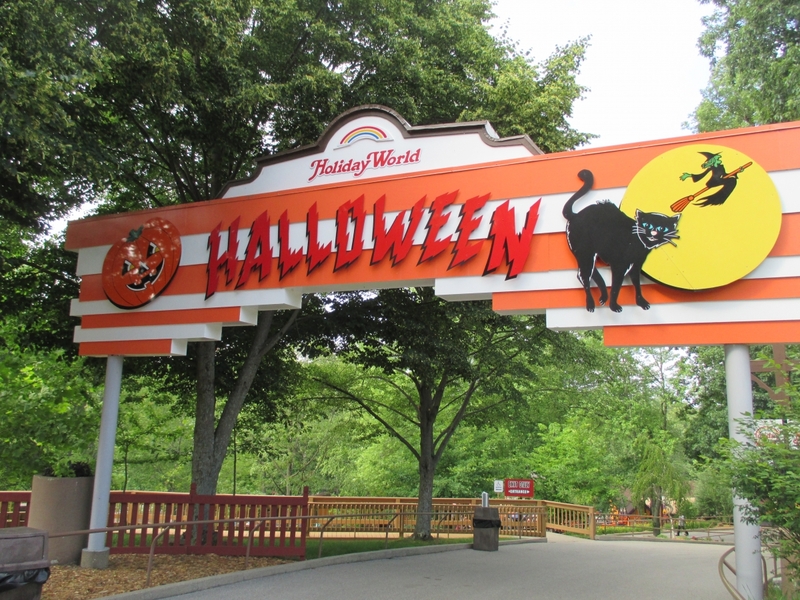 Looks like a visit to a future HoliWood Nights is in store. 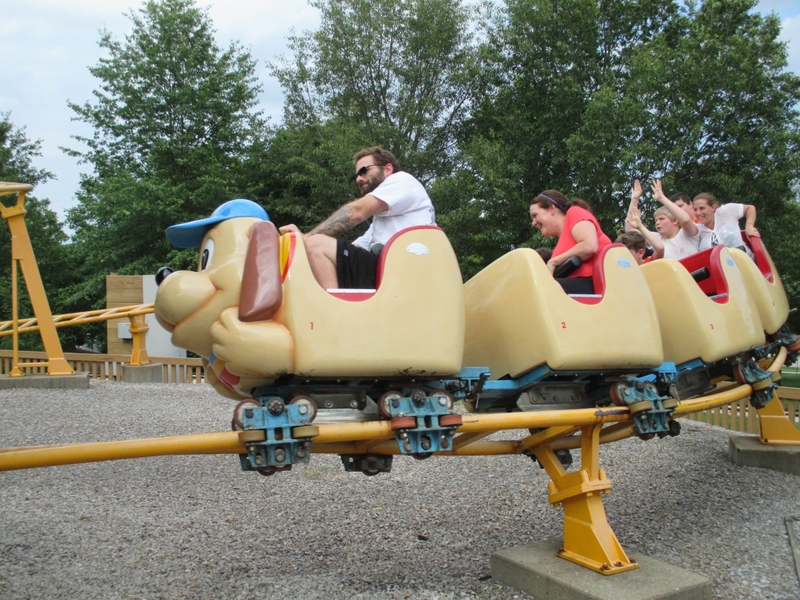 Outside of the coasters, Holiday World has some other really good attractions. Frightful Falls is a nice flume that interacts with the Legend. 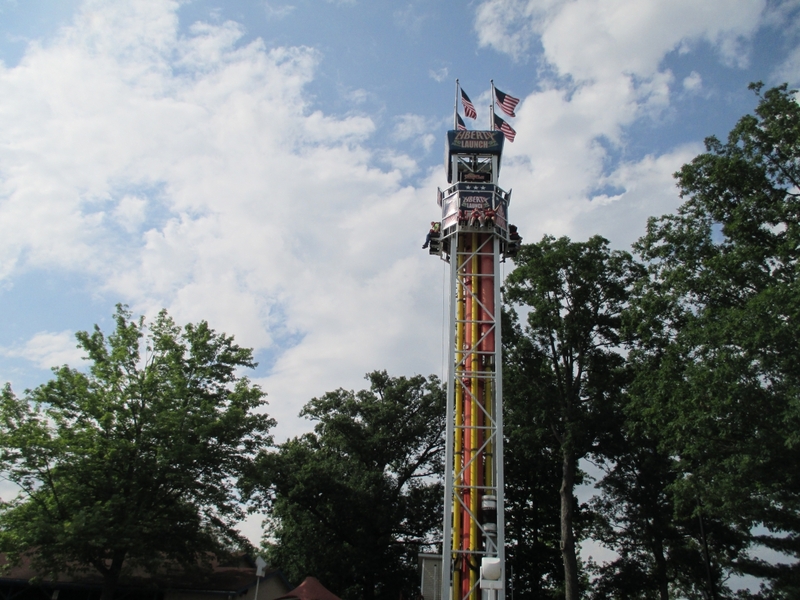 Liberty Launch is a forceful little S&S tower that has more air-time than towers 2-3 times its size. 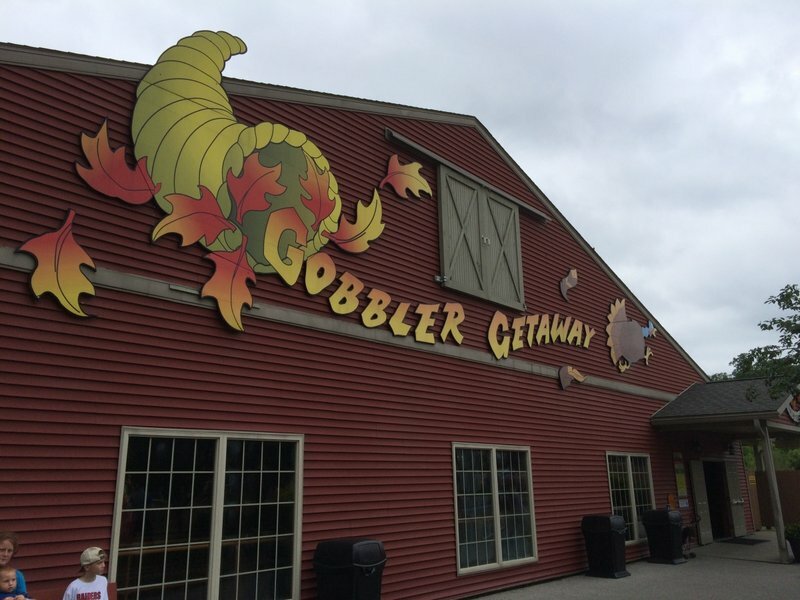 And the Gobbler Getaway was a quirky and undeniably fun dark ride. 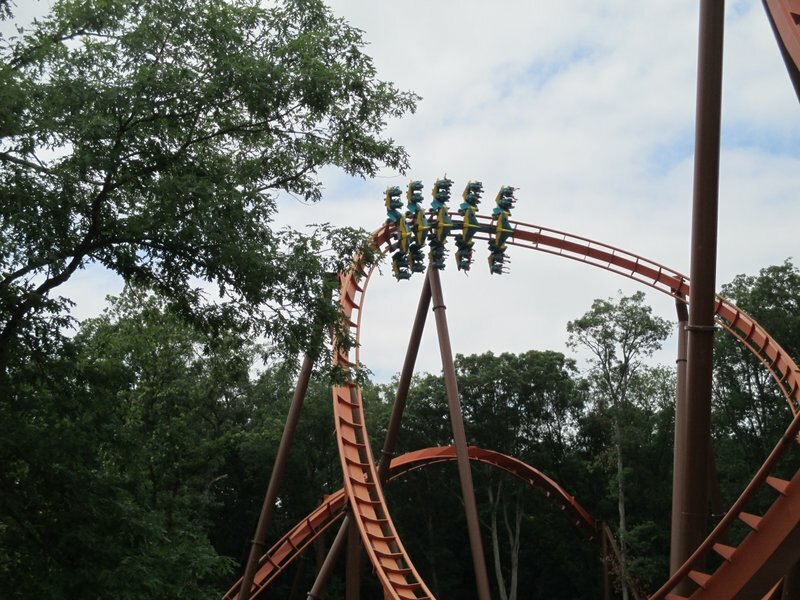 I'd love to see the park add another thrilling flat in the near future since I think that would really round out the ride lineup along with a family coaster. The food was excellent as well. 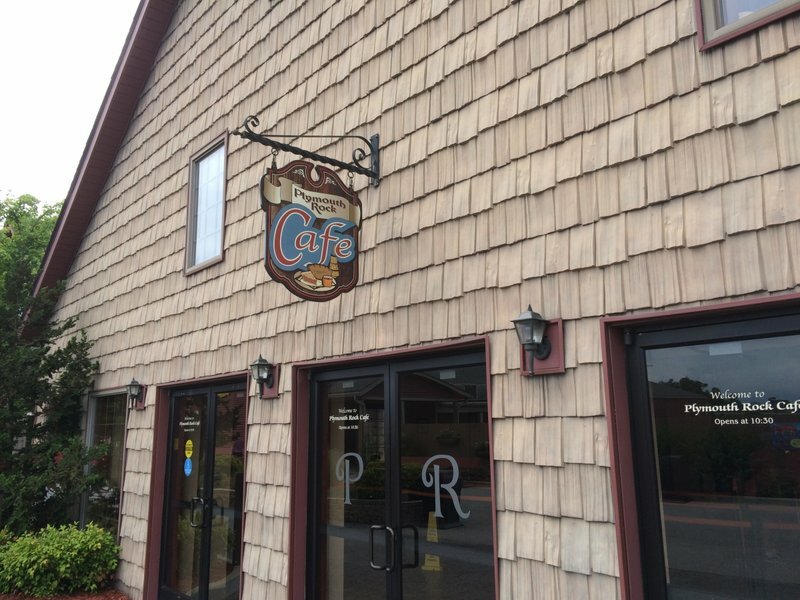 Thanks to everyone who recommended the Plymouth Rock Cafe since the turkey dinner was restaurant-quality stuff and surprisingly big for a theme park meal. 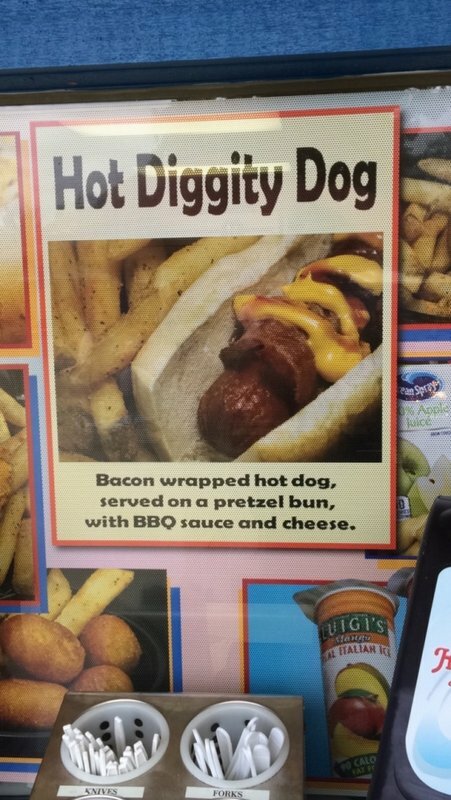 I also go the Hot Diggity Dog (hot dog wrapped in bacon on a pretzel roll) and really enjoyed it despite the fact that it looked like a dried out turd wrapped in a second turd. 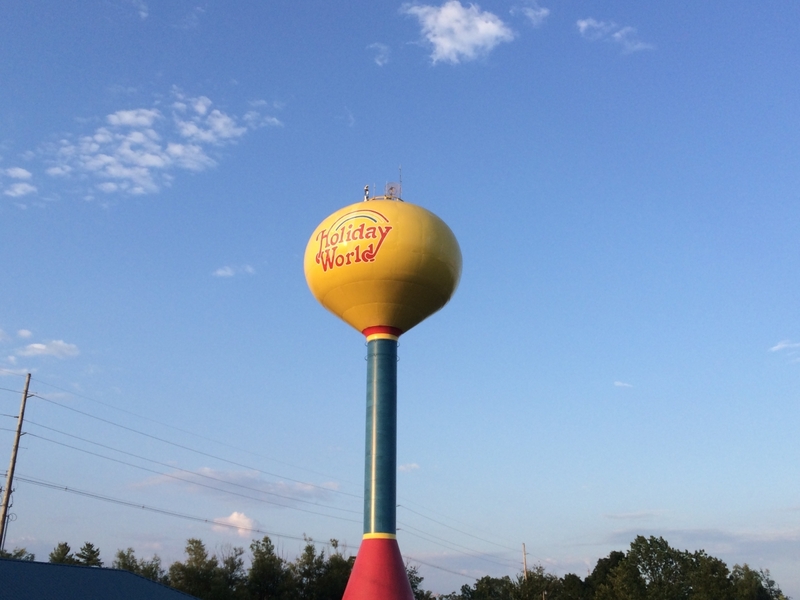 No visit to Holiday World would be complete without a trip to their acclaimed water park. 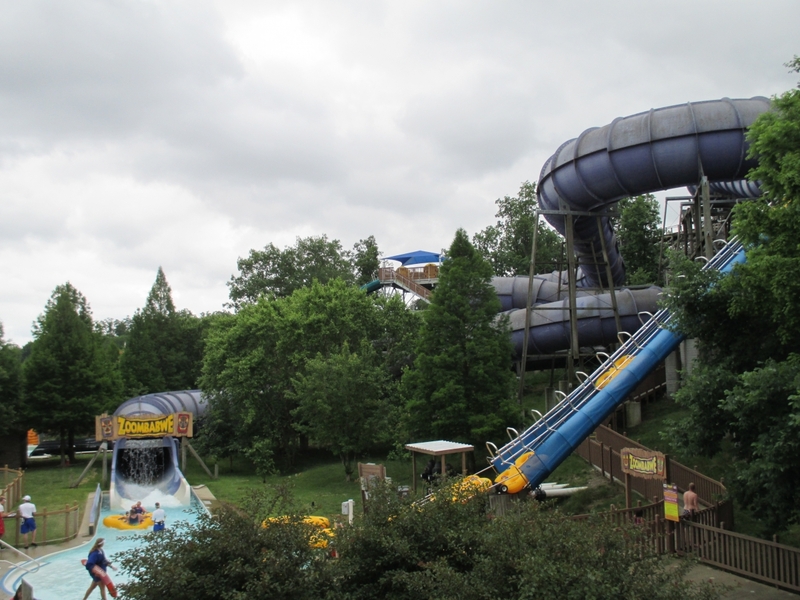 With the stormy skies, the water park was deserted (which sounds rarer than finding a unicorn based on other reports I've read) which allowed me to try all the major slides. 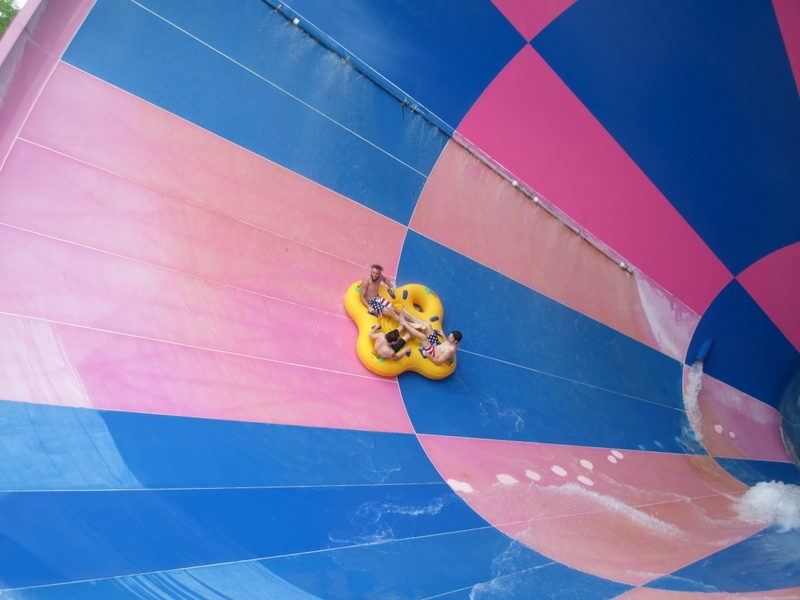 I plan to write up a separate entry for Splashin' Safari since I feel like tacking it onto this report would be an undersell to the water park. Spoiler alert, it's the best water park I've ever been to. 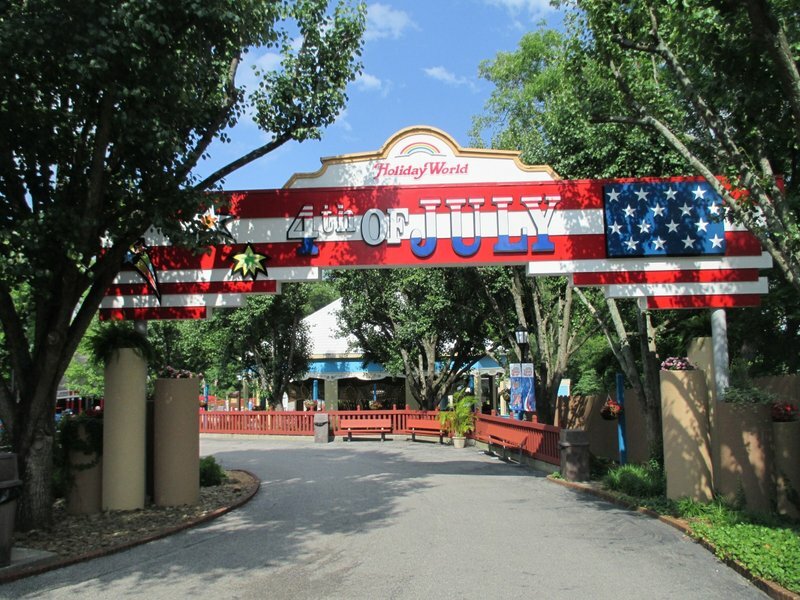 Onto the photos of Holiday World! After seeing 3.5 hours of corn fields, this was a sight for sore eyes. 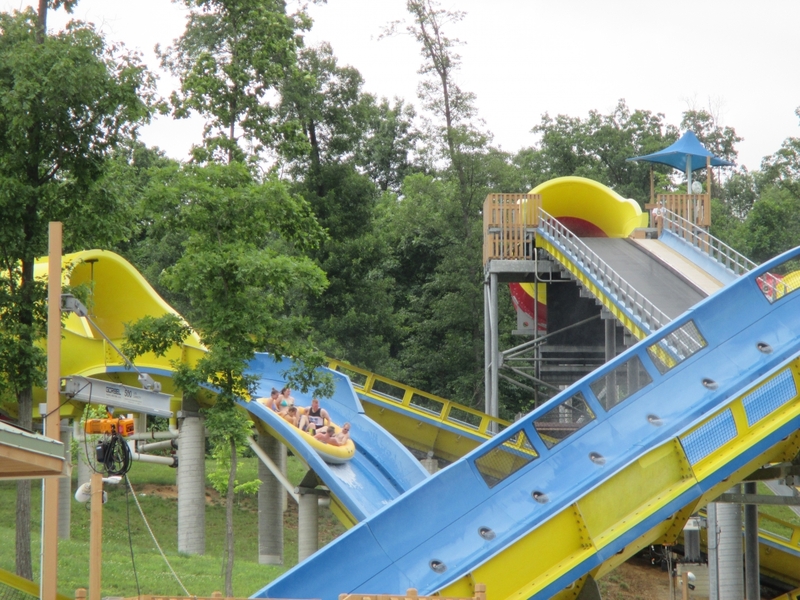 Holiday World was the most anticipated park of the trip and it didn't disappoint! 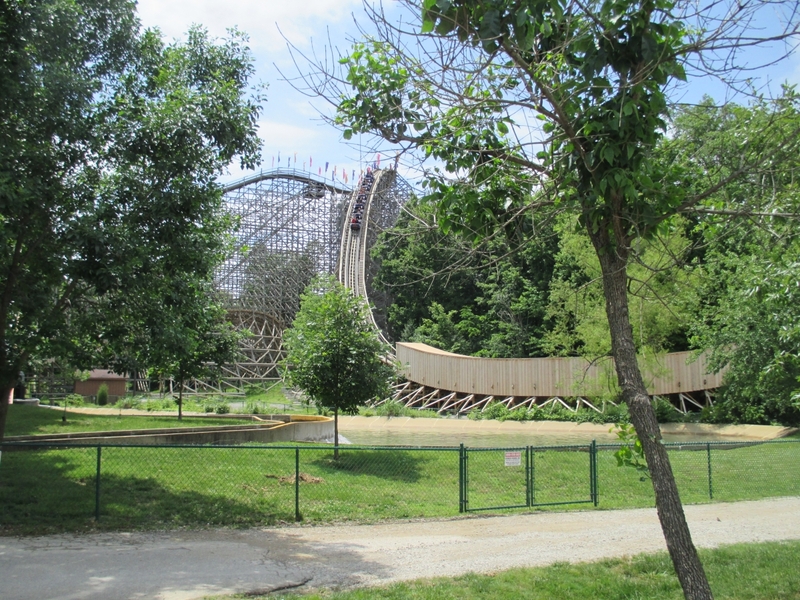 What was once the world's number one wooden coaster was the worst of the park's three woodies. And that's more of a testament to how strong Holiday World's wooden coaster collection is since the Raven was still really good. 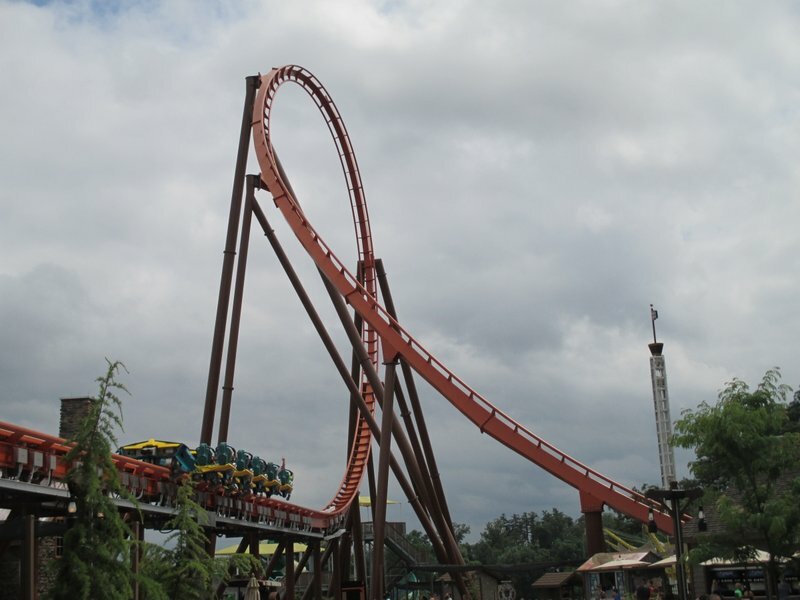 I came off my first ride a underwhelmed, but the more I rode it, the more I loved it. 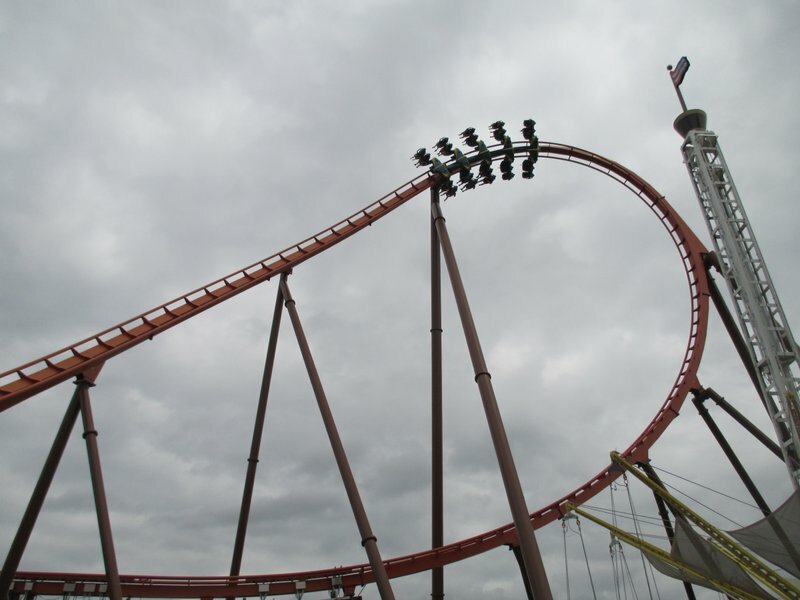 The ride's pacing is impeccable and the layout builds up to the legendary fifth drop and out-of-control finale. The ride also has an outstanding setting. 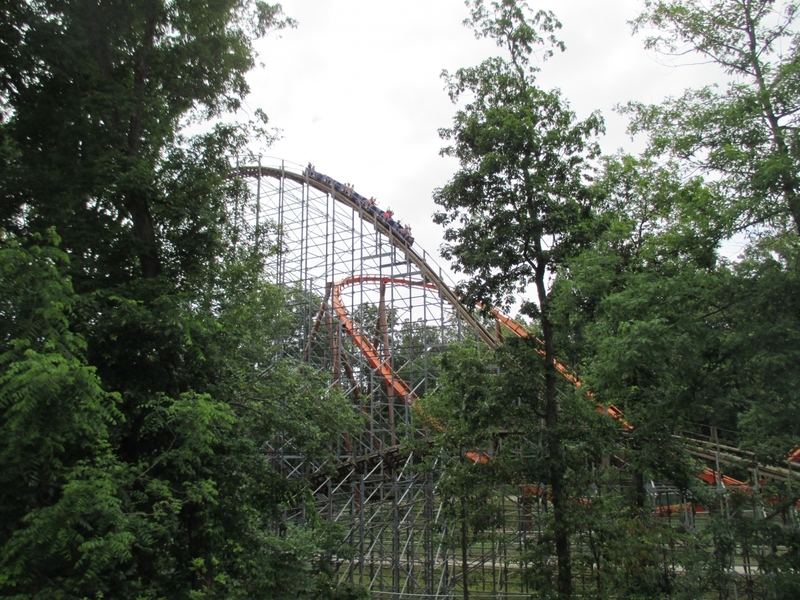 The Legend is the least talked about of Holiday World's woodies, but I enjoyed it more than the Raven. If you look up laterals in the dictionary, you'll probably see a picture of the Legend. The ride mixes solid air with some of the strongest laterals around. But the real star was the Voyage. 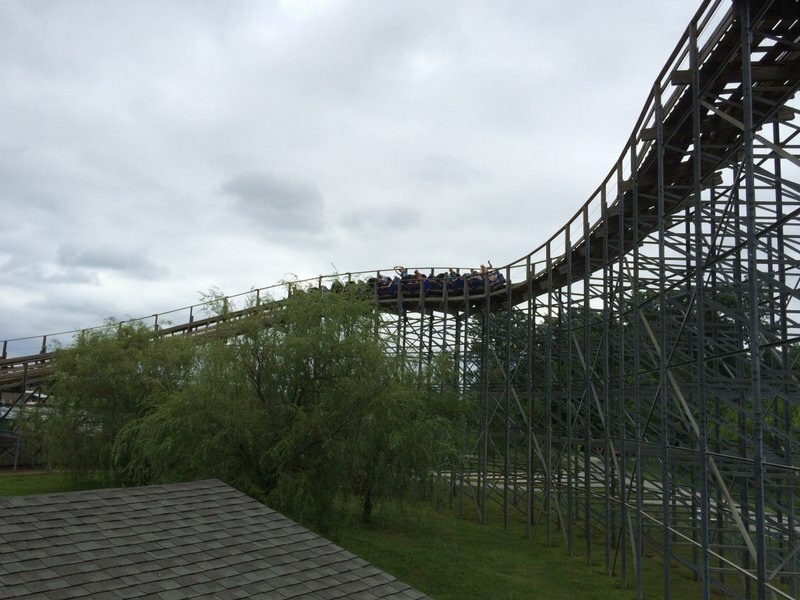 Seeing a traditional wooden coaster this large is awe-inspiring. 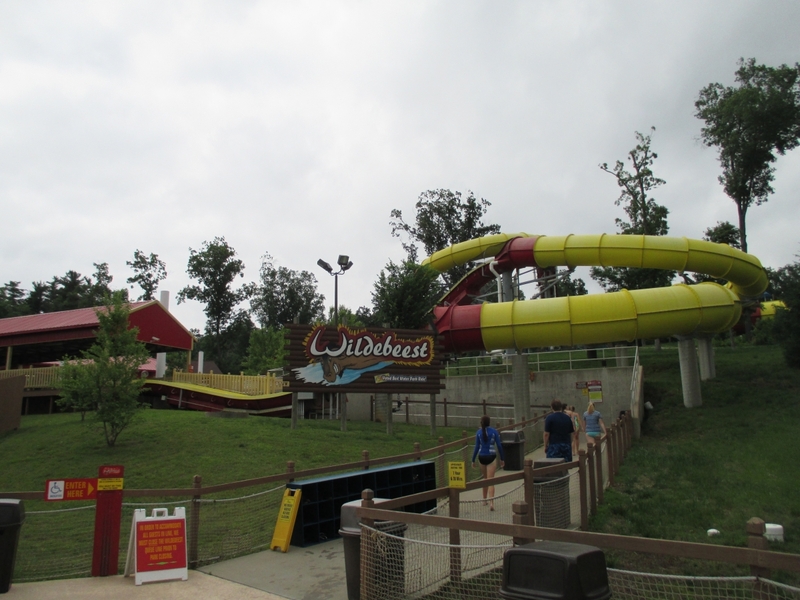 I loved the parabolic-shaped first drop, which seems uncommon on most traditional woodies. It gave great air in the back. The coaster is an air-time buffet from start to finish. Despite having an "out and back" layout, the Voyage kept me on my toes with all the crazy twists and turns along the way. 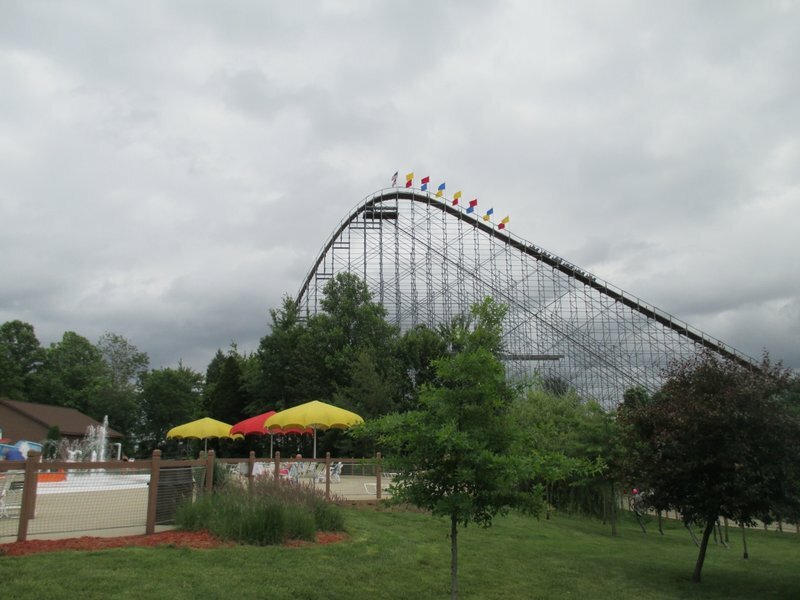 All of Holiday World's coasters have amazing settings. It's a shame the park closed at 7 since I would have loved getting night rides. 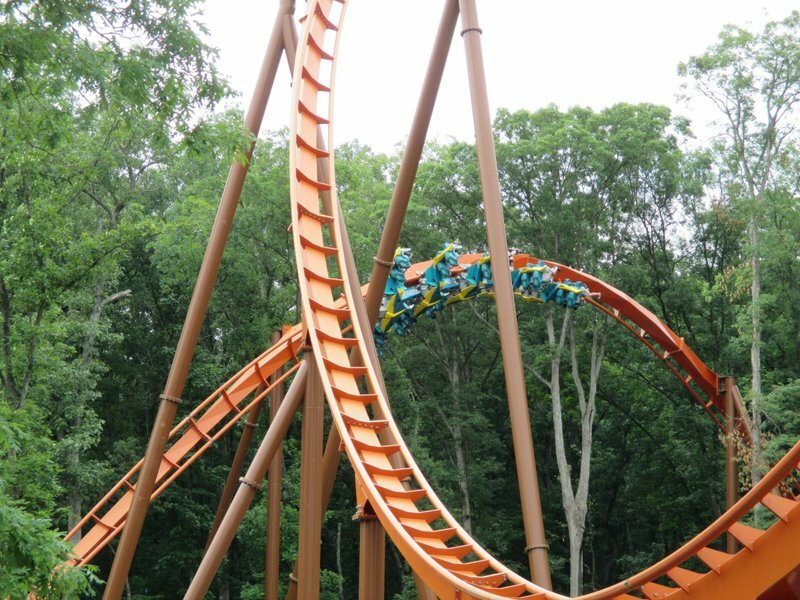 Rounding out Holiday World's major coasters is Thunderbird, a launched prototype coaster whose schedule isn't irregular and subject to periodic closures. I was expecting a dull launch, but Thunderbird's launch had some serious kick to it. Easily the best part of the ride. I missed the wing-over drop, but the large Immelmann sure was impressive to look at. Also as an aside, what on earth is a thunderbird and how does it relate to Thanksgiving? 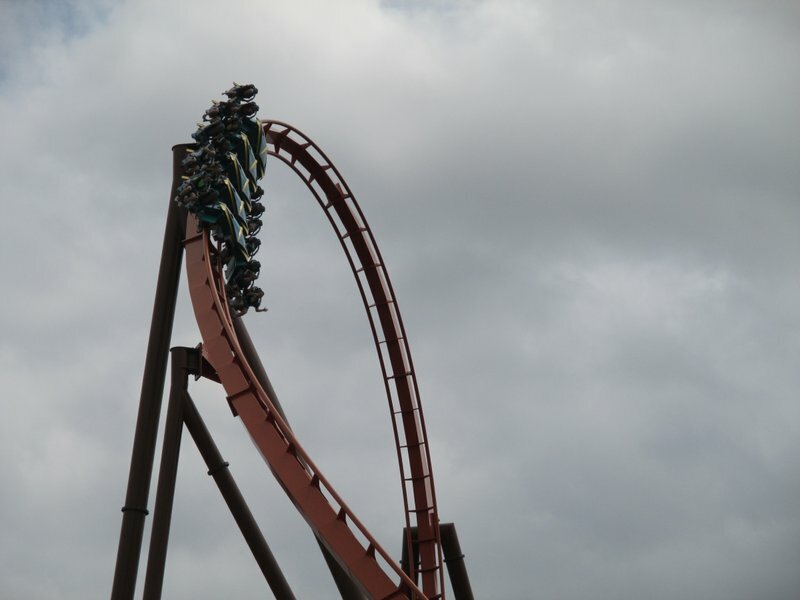 Even when B&Ms are considered "forceless," I still find their vertical loops pack a punch. Zero-G rolls are still my favorite type of inversion. 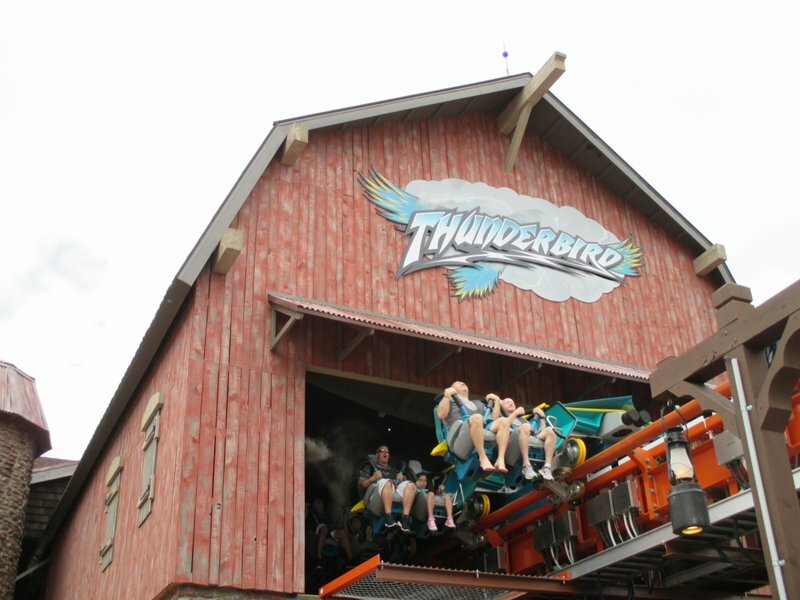 Compared to the 3 woodies, Thunderbird is a nice contrast with its smooth and graceful ride. 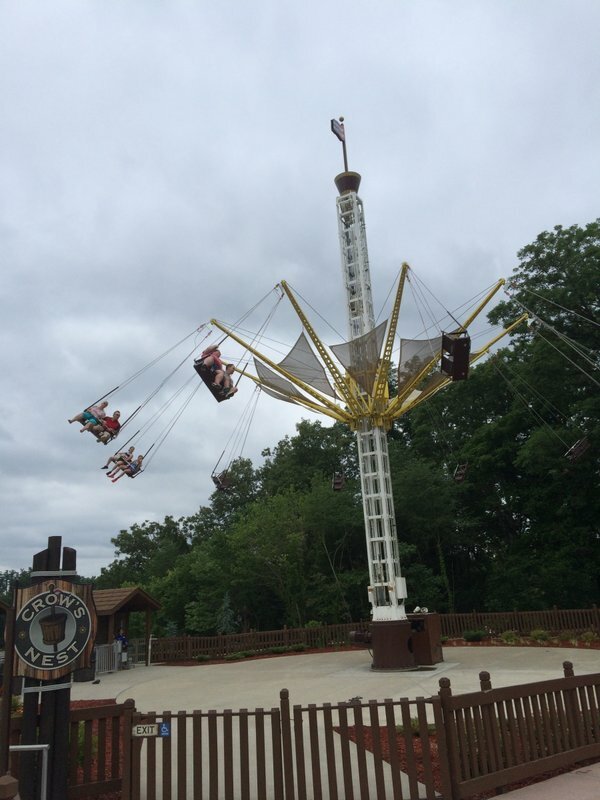 After my tour de France of Holiday World's coasters, I explored their non-coasters. The ride gives some excellent views of the Legend. Frightful Falls has a really weird location, but it's a nice flume. 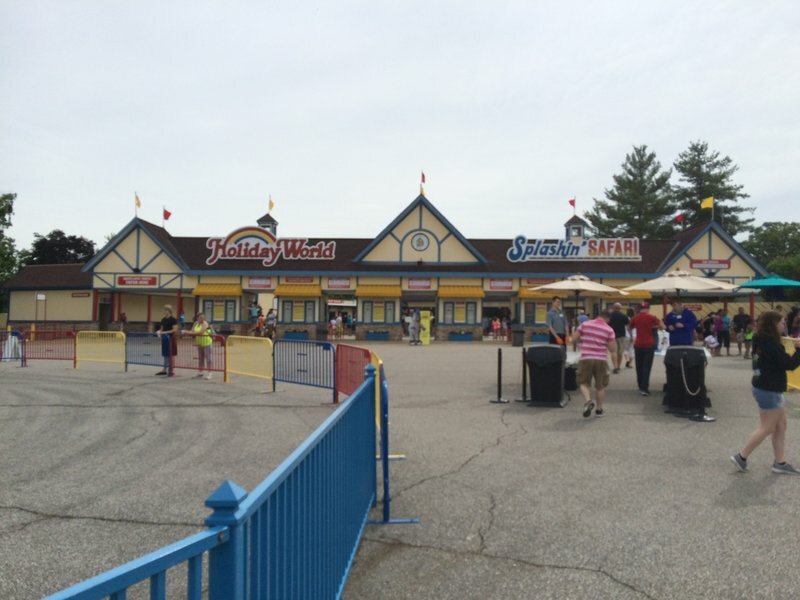 Actually Holiday World in general just has a really strange layout. The cute little star flyer and Thunderbird are awkwardly all by themselves in the very back of the Thanksgiving section. 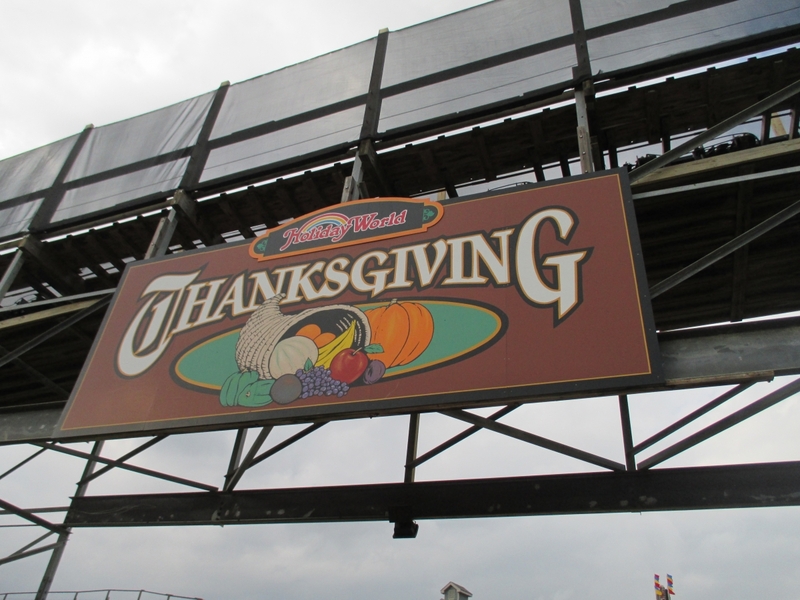 The Turkey Whirl has officially surpassed the Turtle Twirl for the best tilt-a-whirl theme. 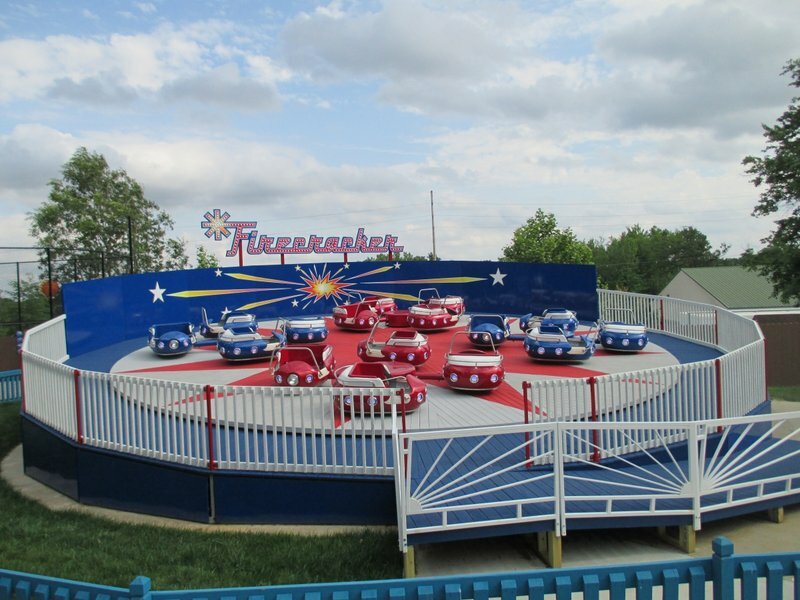 Holiday World even has a cool dark ride. 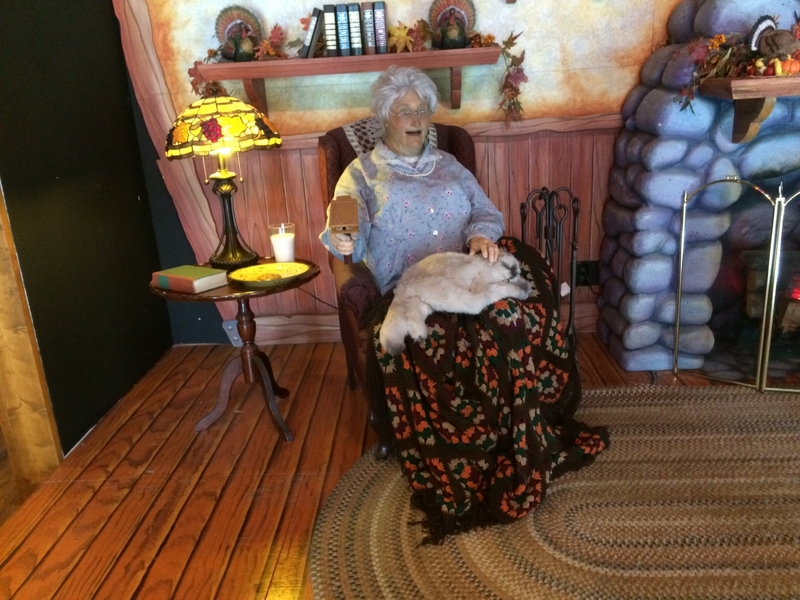 Even Grandma owns a gun...err turkey caller. Because that device definitely doesn't look lethal or anything. Saving turkeys works up quite the appetite, so I decided to eat some afterwards. 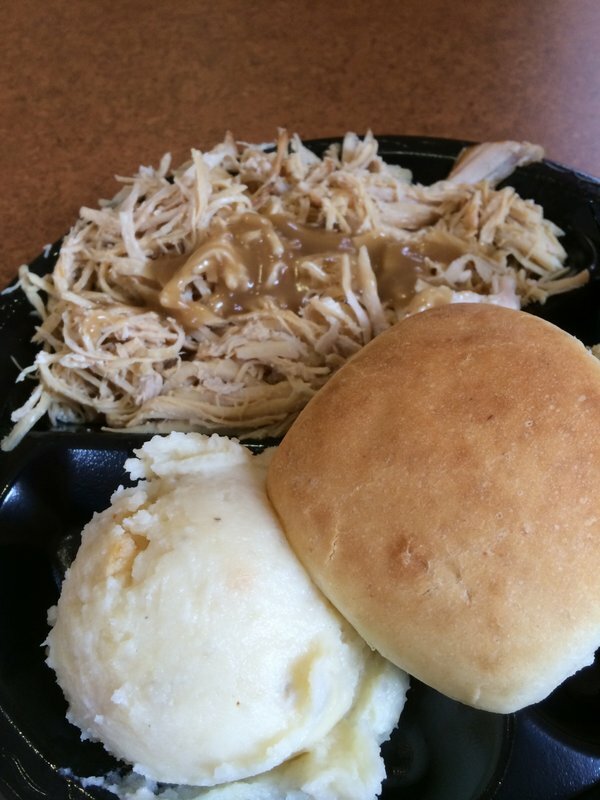 Even the food was outstanding at Holiday World. 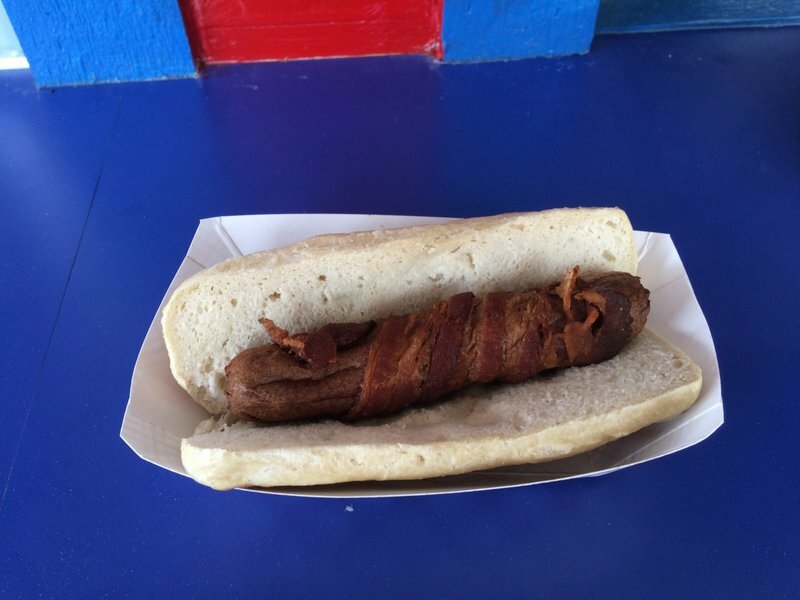 Ok this may look like a dried-out turd but it actually tasted really good. But like many credit whores, I couldn't pass up the allure of a 13ft tall Zamperla. 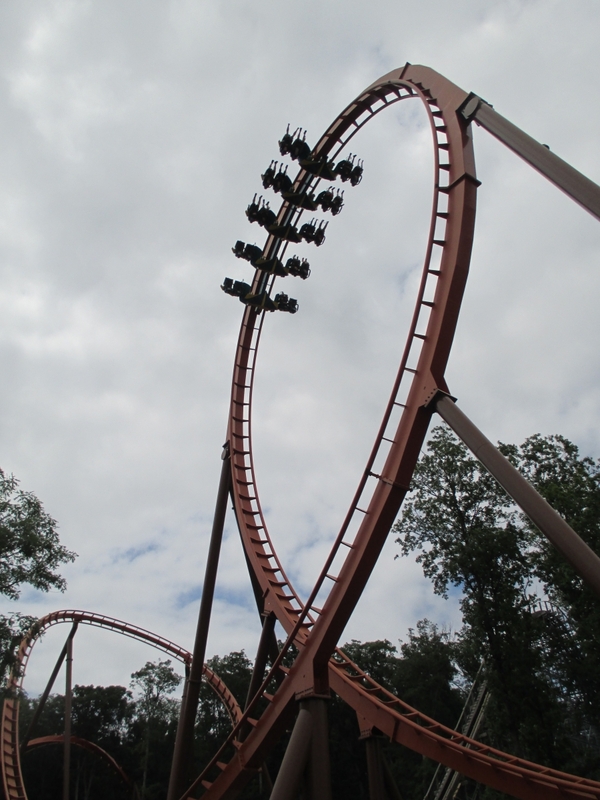 I'm glad Thunderbird ended Howler's reign as the park's best steel coaster since that statement sounds so very wrong for such an acclaimed park. The 4th of July section actually makes America great again. These mini double shot towers are arguably the best drop towers for air time. Firecracker was new for 2017 and looked fantastic. A little slower than the other versions I've been on, but still a fun ride. 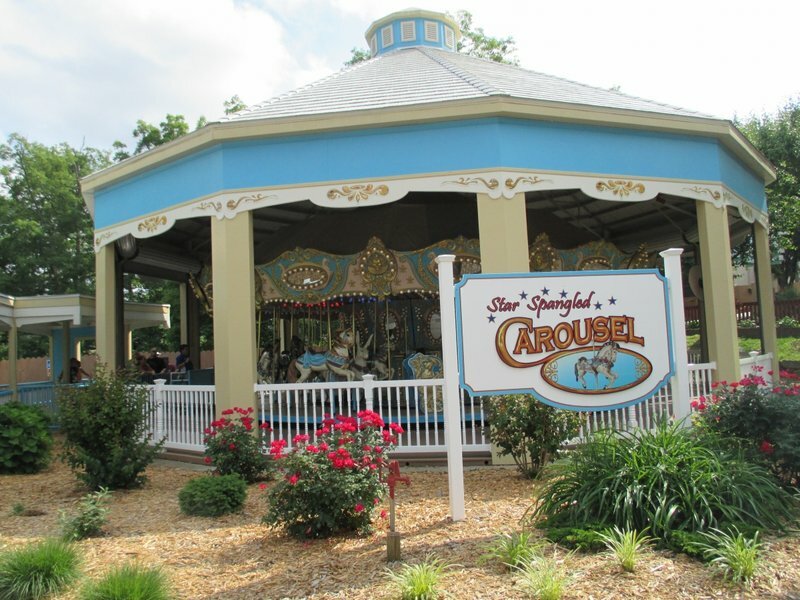 The park wouldn't be complete without a carousel. Bye Santa, I hope to be back soon. 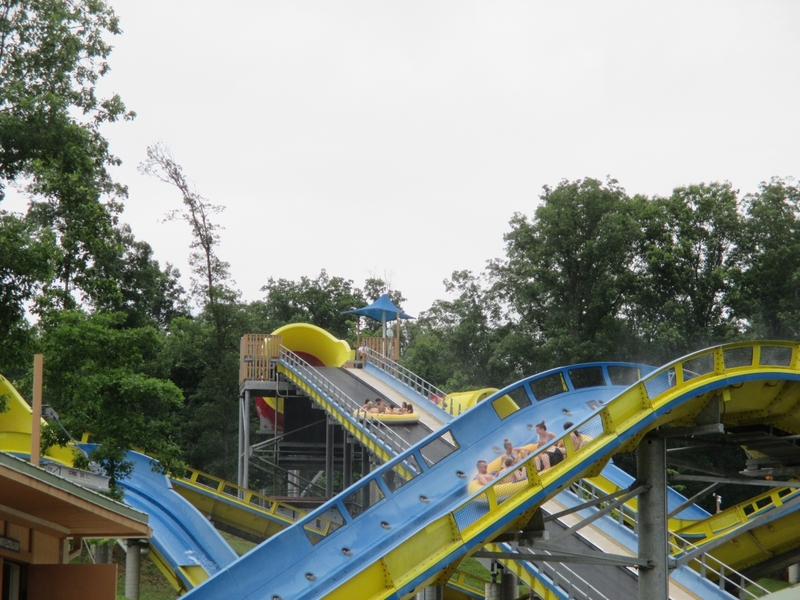 Holiday World is now one of my favorite parks and I see why the place is so hyped up. 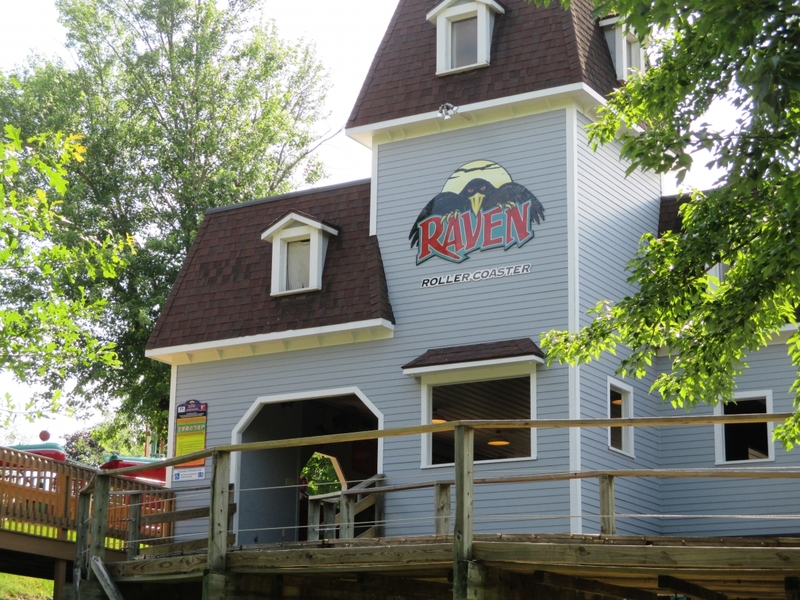 Raven- I figured the Raven was slightly overrated going into my first ride, but I still came off disappointed. 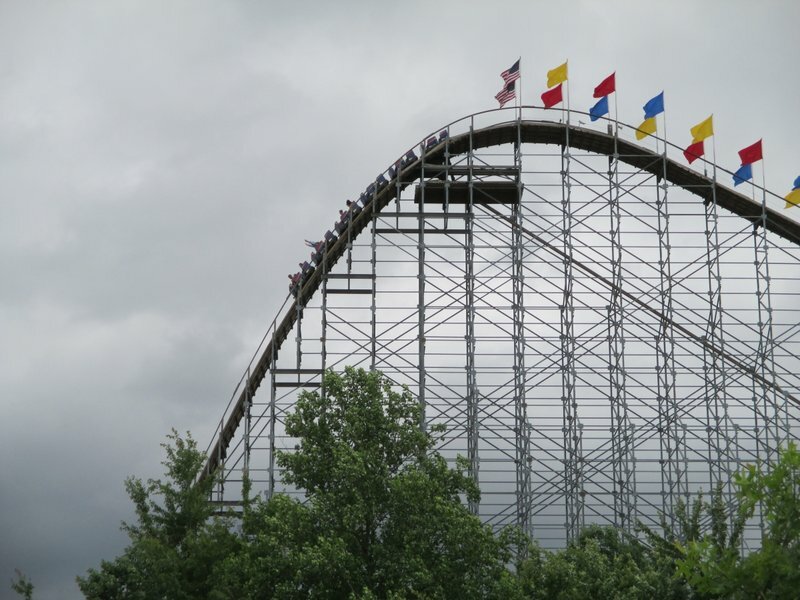 It was a good coaster, but it didn't seem like one that once claimed the spot as the world's best wooden coaster. I'm sure that title had a lot to do with the 1-click rides they used to allow during Stark Raven Mad, pre-2003. I also found Raven to be absurdly overrated. After our one ride I had absolutely no desire to re-ride it. 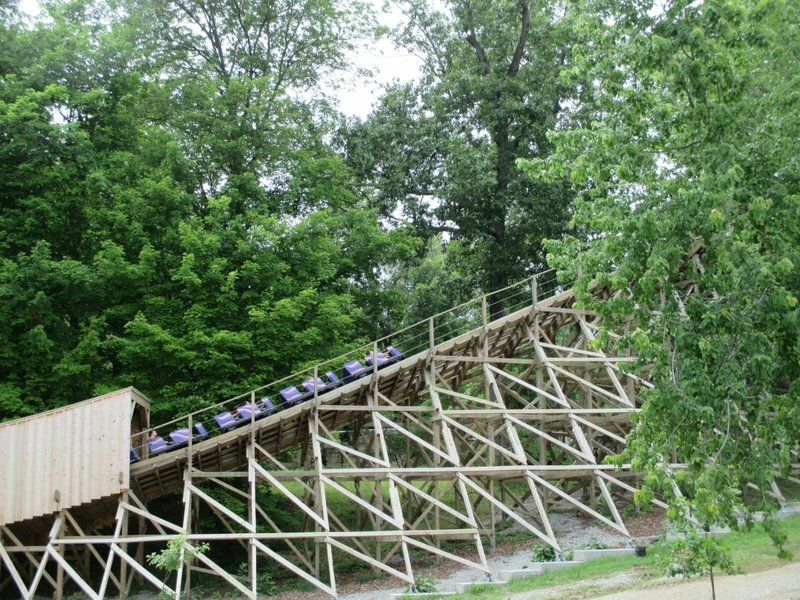 I'm also baffled by the fact that this was ever considered the world's best wooden coaster. Sure, RMC and Intamin had yet to enter the wood coaster scene but Phoenix craps all over Raven and it's not even close. I'm pretty sure it beat Boulder Dash a bunch of times too which is also complete insanity. ^ I agree Phoenix and Boulder Dash are both far superior rides. I did really like the Raven though since it provided a little of everything. 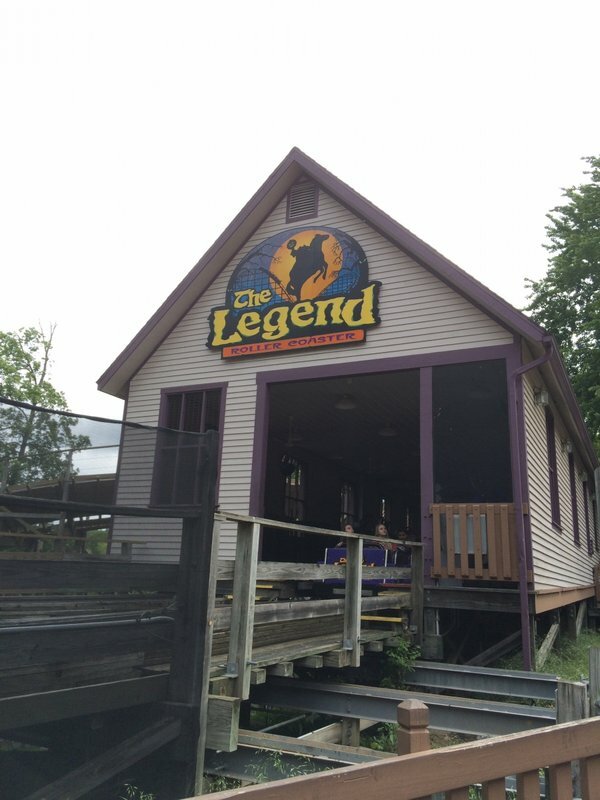 Did you only ride it earlier in the day? My later ride was definitely quite a bit faster than my first. 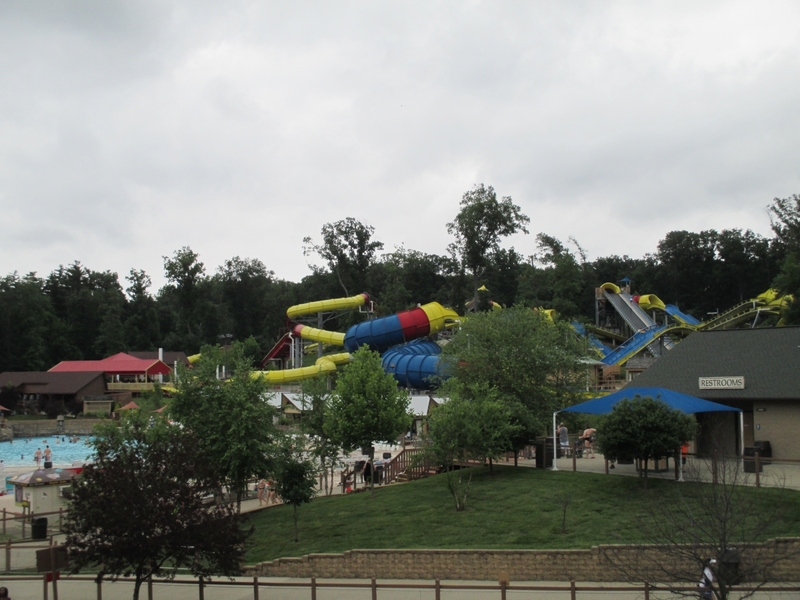 Holiday World's water park, Splashin' Safari, is considered one of the best in the world. 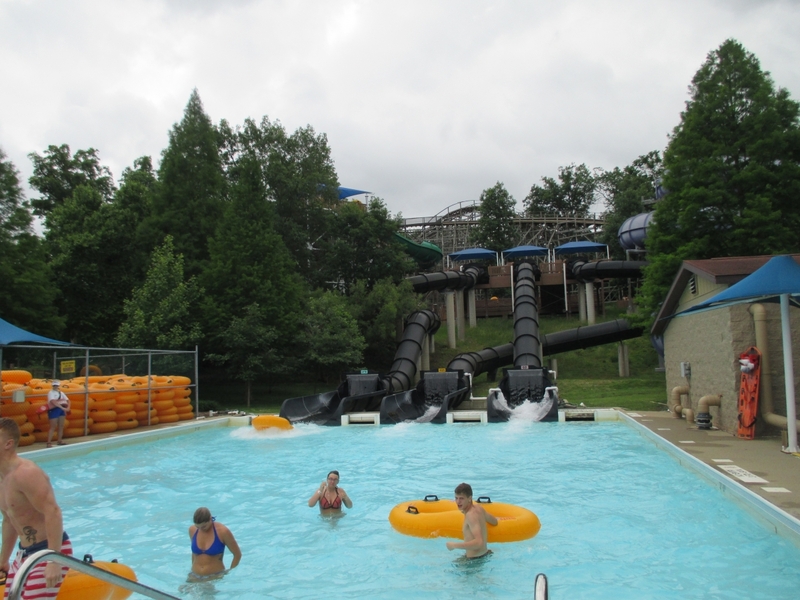 Typically I skip water parks if I'm at a renowned park like Holiday World; however, the allure of two highly regarded water slides was enough for me to break out my bathing suit and show off my amazing sock tan. 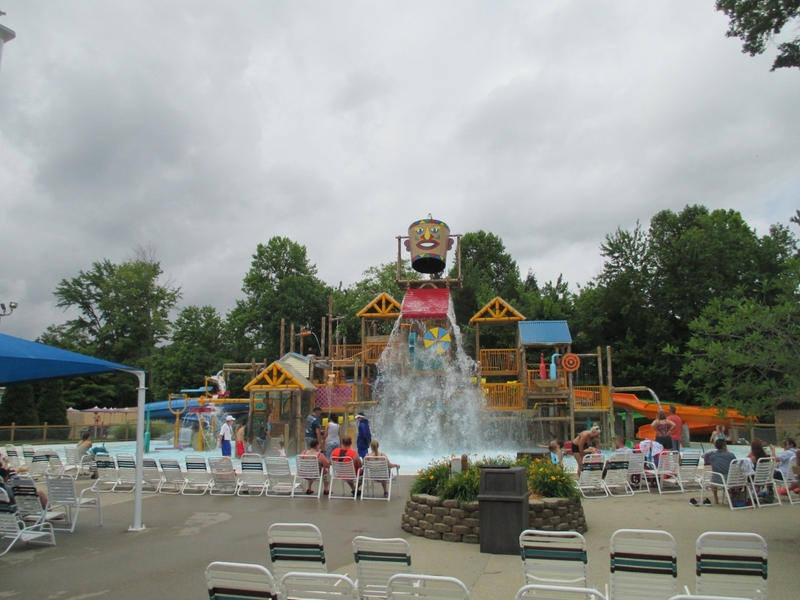 Having visited Holiday World on a day with storms in the forecast, the water park was amazingly deserted which is something I probably shouldn't expect on a return visit. The longest wait I had was probably 5-10 minutes for the bowl slide. The rest of the slides unfortunately didn't have conveyor belt lifts so I had to get some exercise Don't worry, I made up for it by having a feast at the food stands afterwards. 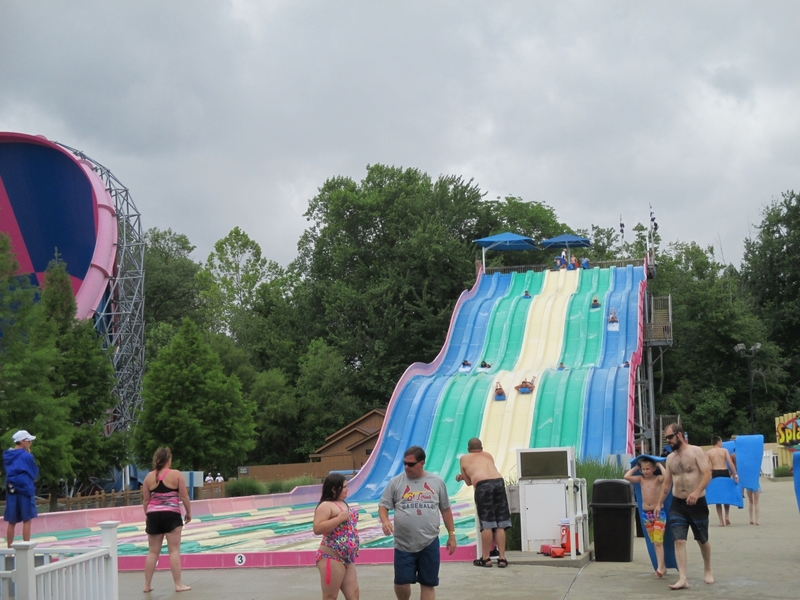 Anyway the rest of the slide lineup was interesting as it lacked a single body slide. I am guessing that is by design. 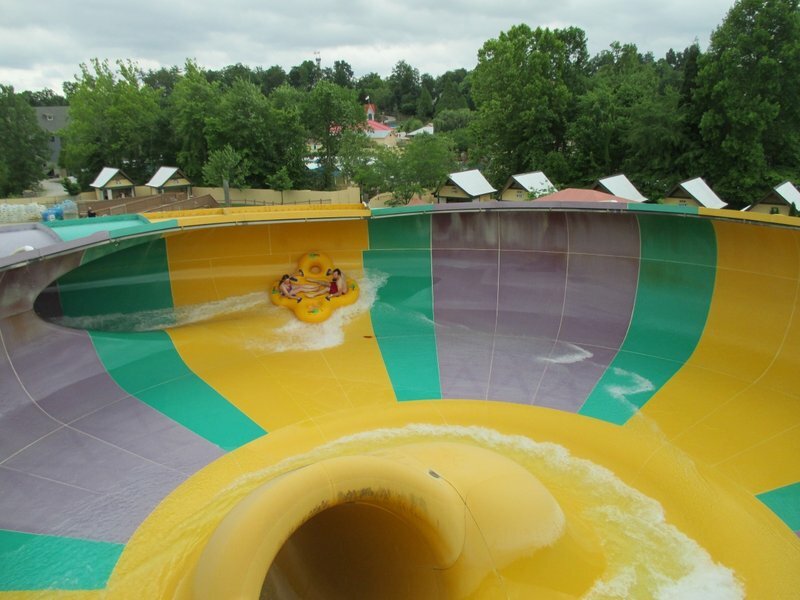 Zinga and Bakuli were two fun slides. The drops on both were great, particularly if you were going in reverse. But the surprise slide for me was Otorongo. That center slide with the massive, pitch-black plunge was fantastic. 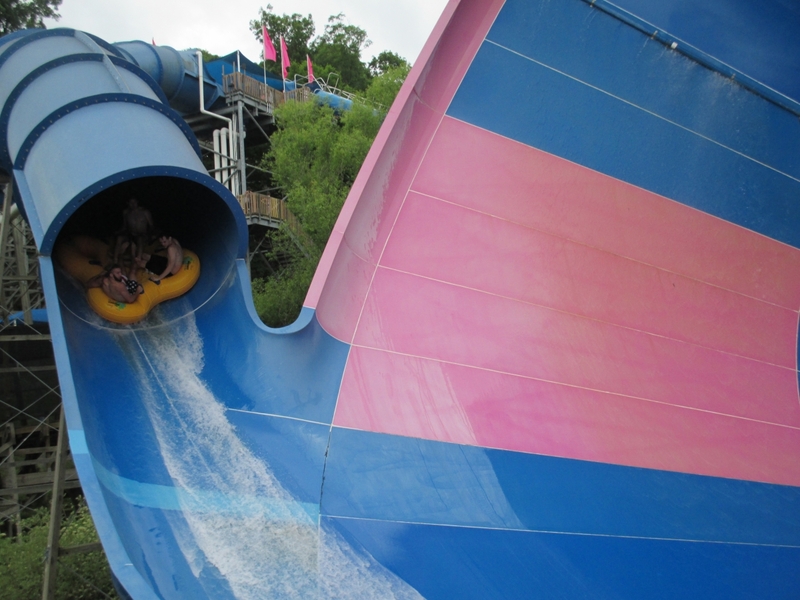 Zoombabwe was another standout because of the slide's length. The weirdest part of my day was seeing a random cat walking around the water park. I have no idea if it was a stray or not, but it was trotting down the midway like any other guest. If Holiday World has any Chinese food stands, let me know if the meat tasted extra fresh recently. Usually I skip water parks unless they have a water coaster. Splashin' Safari happened to have two, so I was lured over to the wet side. I preferred Wildebeast. Pops of air on most drops with the two drops in the shred giving scary floater air the whole way down. Most coasters wish they had air like that. Mammoth was also quite good. It was weird and awesome to be able to experience backwards drops on a water coaster. I will note that Mammoth was absolutely frigid on the cooler day. Every other slide seemed to have warmer water. Of course there are other slides. Though interestingly none of them are body slides. It may have been the day of the Indianapolis 500, but this is the real race to be seen in Indiana. Sorry to all racecar fans I may have offended, but I don't consider that a real sport. 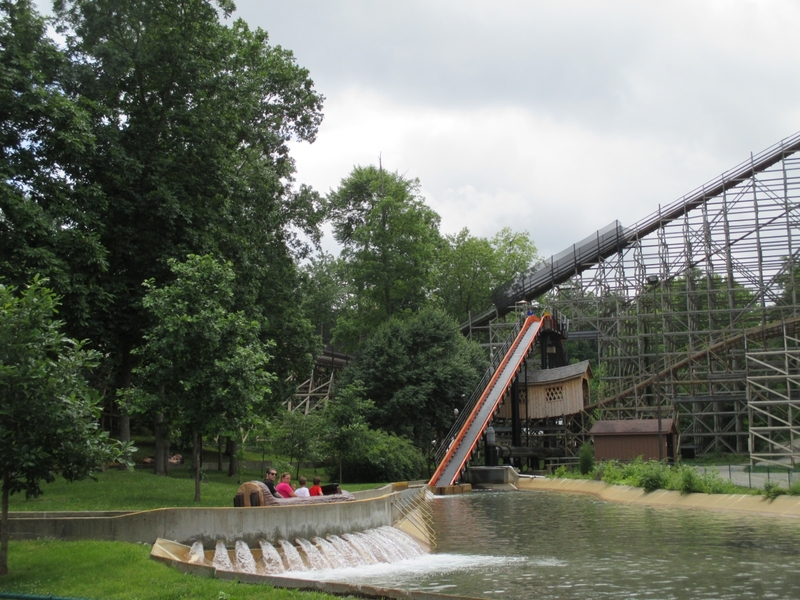 Before Wildebeast was the world's best water slide, the Golden Ticket Awards once gave Zinga that crown. This slide just wouldn't end. I also found it unique how they had the clover tubes instead of the standard circle rafts. No clue what an Otorongo is, but that center slide sure had a great drop. Down the toilet you guys go. 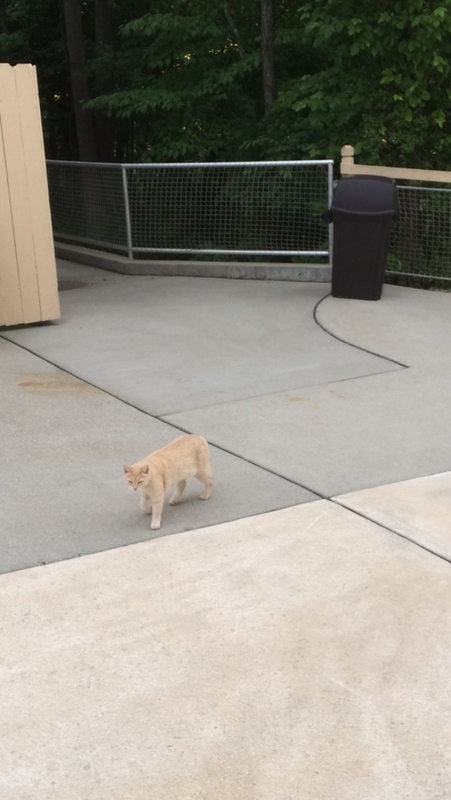 The most WTF moment of my visit to Holiday World was seeing this random cat walking around the water park. Wait a minute, that must be who votes for the Golden Ticket Awards. 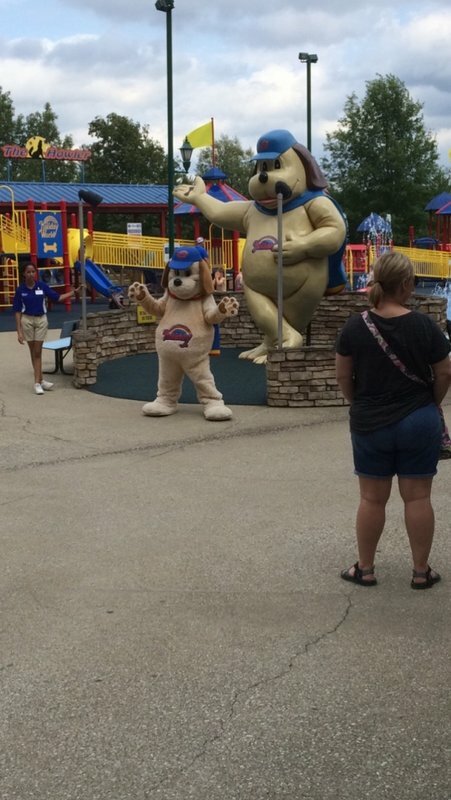 I will end with the water park's star attraction (for young kids).